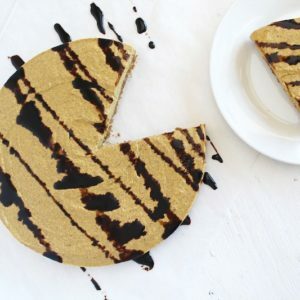 A paleo, vegan AND gluten free pumpkin cheesecake recipe?? Could it be real? Yes! It is real and it is sooo yummy! This recipe would be considered "no bake" if it wasn't for the crust. The crust is pretty easy though and ads a nice crunch and super delicious flavor to the whole cheesecake. The day before starting this recipe, place 1 cup of cashews in a large bowl and cover with purified water until there is at least an inch of water between the top and the cashews. Allow the cashews to soak overnight. If you are using a can of full-fat coconut milk for the coconut cream, be sure to place the can of coconut milk in the fridge overnight. Preheat the oven to 350°. In a food processor or mixer, blend together all of the crust ingredients until they are fully mixed. Press the crust dough into the bottom of the 8 inch springform cheesecake pan. Bake at 350° for 10 minutes then turn off the oven, remove from the oven and set aside to cool. Drain the water from the cashews. Place the cashews into a clean food processor (a vitamix blender can also work to puree the cashews). Blend the cashews until they form a smooth paste. If you are using a can of coconut cream you can scoop it out from the can. If you are using a can of full fat coconut milk refrigerated overnight, the coconut cream will rise to the top and there will be some clear liquid left at the bottom of the can. Make sure you don't add the clear liquid on the bottom--only the hardened coconut cream at the top. Add the coconut cream, maple syrup, molasses and pumpkin puree to the cashew puree in the food processor and blend until everything is mixed and smooth. To ground the chia seeds, grind them in a coffee grinder. Add the ground chia seeds to the food processor along with the cinnamon, ginger, nutmeg, allspice and clove. Blend until everything is mixed. Once the crust has cooled completely, scoop the cheesecake batter onto the crust in the springform pan. Refrigerate for about 3-6 hours to set. Decorate the cheesecake with a molasses drizzle right before serving. Remove the cheesecake from the springform pan, then drizzle the molasses over it from left to right.